All our precious bundles of joy deserve loving care from gentle cleaning. That's why Pampers Fresh Clean Baby Wipes provides a balanced wetness to leave the skin feeling cleaner, whilst helping to maintain the natural pH level. Its unique Soft Grip Texture helps to clean mess in a moment whilst providing a refreshing scent. Don't fear the mess again, with Pampers Fresh Clean Baby Wipes. Gently cleans bottoms, hands & faces. Helps maintain skin?s natural pH. Soft & strong for gentle cleaning. With baby fresh scent lotion. Dermatologically tested and free of alcohol. With moisture protect closing system. Want to know more about the components Pampers uses? Visit pampers.co.uk, pampers.ie. All our precious bundles of joy deserve gentle cleansing, that is why Pampers Fresh Clean wipes contain a balanced level of moisture to clean the skin whilst helping to maintain the natural pH level. 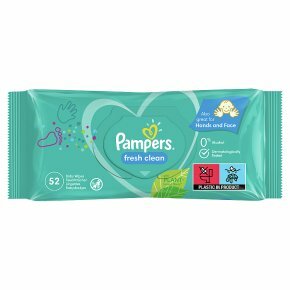 Pampers Fresh Clean Wipes also deliver a refreshing scent. Pampers Fresh Clean wipes are dermatologically tested and free of alcohol. Don?t fear the mess again, with Pampers Fresh Clean wipes. Please dispose of wipes in the bin - do not flush wipes.